There is a significant amount of research on dementia, memory, and neurodegenerative disease being released this week at the American Academy of Neurology (AAN). The research is also being published in the journal Neurology. Here is a recap with short descriptions, comments, and links. Simple tests such as walking speed and hand grip strength may help doctors determine how likely it is a middle-aged person will develop dementia or stroke. Researches explored the association of two simple office based tests, walking speed (WS) and hand grip strength (HGS), with the risks of incident dementia and stroke/TIA, and with brain MRI and cognition. 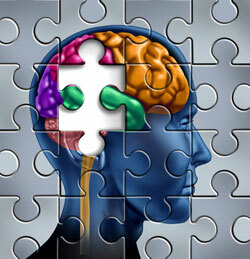 Alzheimer Disease (AD), the most common cause of dementia, begins years before the onset of symptoms. The amount and quality of sleep you get at night may affect your memory later in life. New research suggests that consuming between 2,100 and 6,000 calories per day may double the risk of memory loss, or mild cognitive impairment (MCI), among people age 70 and older. The odds of having MCI more than doubled for those in the highest calorie-consuming group compared to those in the lowest calorie-consuming group. The results were the same after adjusting for history of stroke, diabetes, amount of education, and other factors that can affect risk of memory loss. This research suggests weight training for two years significantly improves the motor symptoms of Parkinson’s disease compared to other forms of exercise such as stretching and balance exercises. Improved motor status over 24 months in a progressive neurodegenerative disease suggests that long-term progressive resistance exercise could be considered an integral component of comprehensive disease management. This last study on Parkinson's symptoms really caught my attention. When I first took Dotty into the gym at age 87, I enrolled her in a low impact aerobic class for older people. After a while, Dotty started working out on the treadmill and on the weight machines. Once we move to more serious exercise, I saw continued improved balance and positive changes in Dotty's mood and behavior. I believe these positive changes were the encouragement, the catalyst really, that lead me to believe that Dotty could do more, and that we could continue living our life.